Welcome to Italy Gay Travels! Italy Gay Travels organizes all gay tours and events and Bespoke Tailor-Made Tours in Italy. Join one of our small group tours in the most beautiful Italian places off the beaten track, or ask us to tailor make your dream holiday of a lifetime for you. We also review the best gay and gay-friendly places in Italy for you, so you are safe when booking your holiday in Italy with us. We know you love travelling, so do we. Like you, we know that while travelling is very important, feeling safe and at home in the place you travel is equally as important. There are many places out there that claim to be gay or gay friendly. However, often what you read on the tin isn’t in the can! 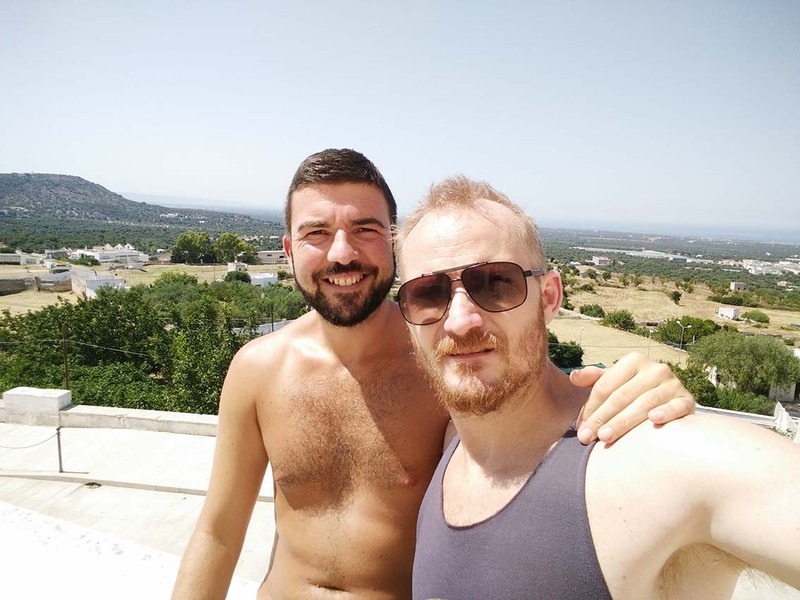 Here at Italy Gay Travels we visit as many places as we can, getting to know the owners and trying out the fruits of Italy to ensure that when you visit, you know you are in safe hands and free to be yourself. Italy Gay Travels is the brainchild of Sergio and Kendall, 2 gay travellers who love to explore the world. We happened to meet in Puglia, a region in Italy that we both love. We both share the same vision and enthusiasm for this beautiful place and of course, for all the things Italian! I am an Italian Gay Travel Blogger. I am also known as Scruffy Gios, The Scruffy Italian Traveller. The Scruffy Italian Traveller is 100% Italian: I was born in Taranto a few years ago (more or less). Taranto is one of the cities in the beautiful region of Puglia, the so called ‘heel of the boot’. I love the finest things in life: sea, beach, nice nights out, cozy nights in, great food and good wine. All this is quality of life for me. (Los Angeles, Madrid, London) and traveling all over the world, I returned to Puglia. I am now ready to make the rainbow shine all over Italy, even bigger and even brighter! I am not like Sergio! Thank God, someone has to be the Zen in this partnership. I am a South African born traveller who moved to the UK in my early 20’s. I tried the fast-paced city life for many years and although I loved it, I soon realised it was not for me. I started travelling the world and found that I liked places that were down and dirty. I also developed a love for all things holistic and spiritual and started a journey down that path. I studied to be a holistic, Thai and sports massage therapist and took up Yoga, a sport I love! Last year I reached a point where I was tired of the city life so I threw caution to the wind and moved to Puglia! Crazy I know. Here I met Sergio and our ideas merged. I love this region, it is filled with diversity, culture, good food, open people and laughter. I would love to share this adventure with you all and I hope you are ready for the adventure, I know I am!